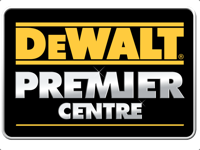 DEWALT Premier Centres are highly qualified specialist retailers who have a full and intimate knowledge of the DEWALT range. With an extensive range of products in stock, high levels of customer service and technical expertise, DEWALT Premier Centres will be able to assist you in making the correct choice of tool and accessory to meet your needs. 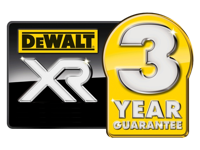 As a Dewalt Premier Centre ALL Dewalt products sold by Goodwins Margate are UK/EU specification tools and are fully covered by Dewalt manufacturer warranty. In the event of a warranty related issue with any Dewalt product purchased from Goodwins Margate, the item, with a copy of your invoice (proof of purchase) for 12 month warranty, or a copy of your Dewalt 3 year warranty registration certificate for 3 year warranty, can be taken to any Dewalt Warranty Service Centre, in the UK, where any warranty issues with the product can be dealt with. You can return the tool with the warranty issue to us, either in person or by post. Make sure you include a copy of your invoice for 12 month warranty or a copy of your Dewalt Warranty Registration Certificate for 3 year warranty. As well as your name, address and contact details. Also please supply as much information as you can about any issues with the tool. We’re often asked if we do warranty work on Dewalt tools not purchased from us. We certainly do, if your item is EU/UK specification (CE Marked) and you have proof of purchase, which is a valid invoice, or a Dewalt registration certificate and you are local to us, and can get the tool to us, we can do the warranty work. If your Dewalt tool has originated from outside of the UK/EU, purchased by yourself, or supplied by a seller who has imported the tool from outside of the UK/EU market, then sold it on. Your tool will NOT have a CE Mark and therefore will have ZERO Dewalt Manufacturer Warranty and will NOT be fixed under warranty at any Dewalt Service Point, in fact if it has no CE Mark our own technicians will NOT work on the tool under any circumstances!